Wedding drones are becoming more and more popular, especially for outdoor weddings, but are they really worth it? We’ve got some information that might help you make a more informed decision when it comes to unconventional wedding photos and videos. Drones are awesome but can also be tricky to operate. If you do decide you want a drone at your wedding or special event, we definitely recommend hiring a trained professional like you would for anything else. Accidents do happen with drones, which is not something you want to deal with during your special day. Make sure your drone photographer and your ground photographer collaborate and work out a game plan ahead of time. You don’t want your drone photo bombing your ground photos! More importantly, make sure you/your drone pilot have the necessary permits required by the state/city of your wedding. Drone insurance is also a good idea – better safe than sorry! Drone shots can capture dynamic, illustrative videos and images that give a whole new perspective to your event. Especially for outdoor weddings, drone photography and videography offer unique scope and scenic context of the beautiful location when you choose to wed. Getting married in the Rocky Mountains? Drones can help you capture the FULL beauty of the place we call home. Drones help us see things we can’t normally see. Consider gathering your guests on the lawn to spell out your new last name or a wedding ring and snap a pic! Drones also can (quietly) help capture intimate moments that would seem inauthentic from the ground such as the bride and her father on one side of the door while the groom waits at the alter. The beauty of drones is that they especially help the busy bride and groom witness moments that they may normally miss. Drone pilots CAN fly inside but it’s much more risky. While it’s possible to do aerial shots inside, as long as the ceiling is high enough, the danger of hitting something is much higher. Additionally, drones inside can get noisy and sometimes annoying. Drones are much more practical and probably more beneficial if you’re having an outdoor wedding, whether that means with Benson Tent Rent or on a boat! To drone or not to drone, that is the question – hopefully we helped you find your answer! Why would you want more perspectives of your special day? If you can include the beauty of the natural world around you with your wedding guests, drone photos and videos are definitely worth the extra money. 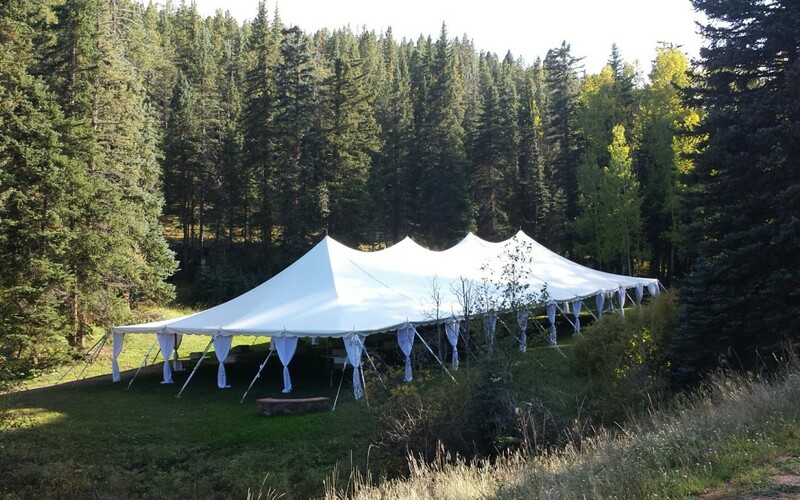 If you’re ready to start planning your outdoor wedding with Benson Tent Rent, be sure to ask us about what we can do with lighting so you can still get great aerial shots after the sun goes down.